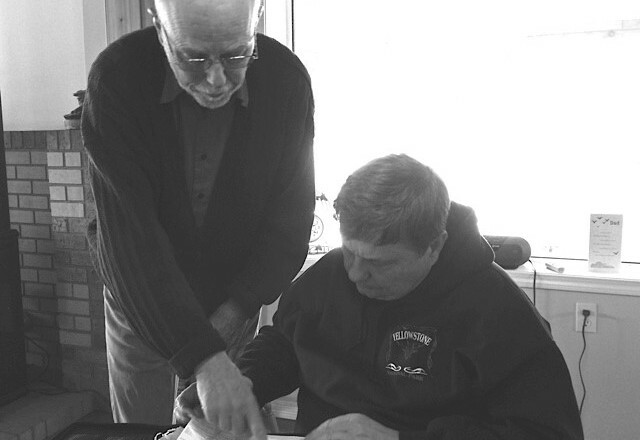 Les (left) and Charlie review farm records. February in a dry Texas does not prepare a person for February in the middle of British Columbia. So Charlie showed up at the house in a thin nylon breaker and runners. “Maybe our fella from Minnesota should have done this inspection”, he said with a grin. Charlie is an auditor for Animal Welfare America, a non-profit established by a wealthy American widow and her daughter a few years ago. Their initial aim was smaller in scale but caught on with other philanthropists with an environmental/food focus and the outreach has grown to include beef cattle among other livestock. They’re inviting producers who share their views and put the ideas into action to apply to them for an AWA designation that guarantees the animals are cared for in a humane way. All of that, the inspection, the labels, the advertising, connection to other like-minded producers in both Canada and the US are provided at no cost to the producer. We were amazed and impressed and felt affirmed by the effort. AWA is the real deal, putting their money where their mouth is and many other clichés about doing good. The only part of the designation that had a price tag attached was the Grass Fed audit. We paid $100 for that part of the inspection. The Grass Fed designation means that our market animals were born and raised on our farm and that they are fed only forage all their lives. 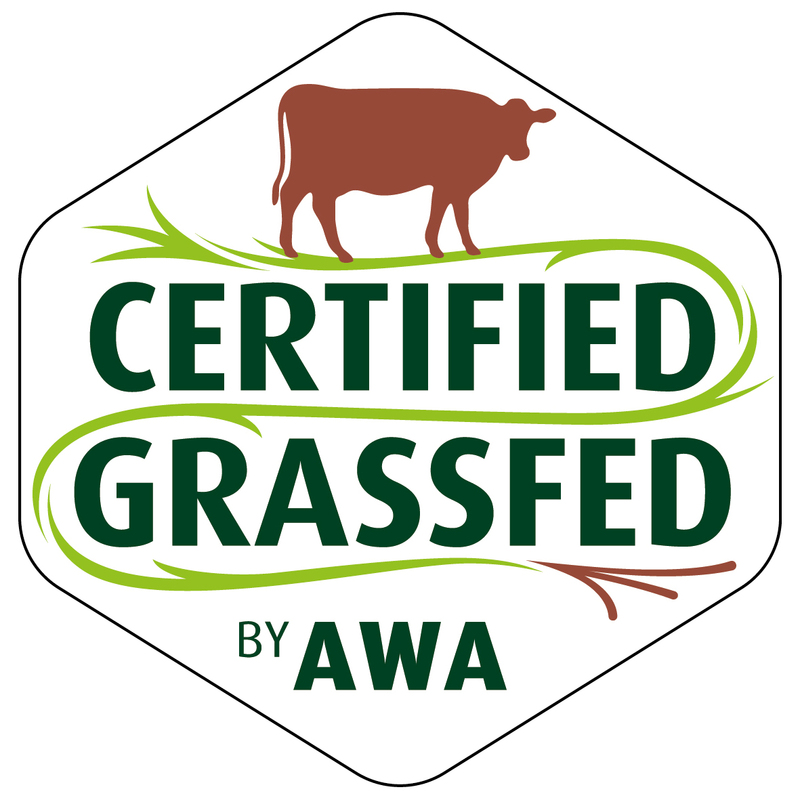 With the AWA Grass Fed stamp people know the meat is as advertised and we can expect an annual audit to confirm the claim. Charlie was here for the best part of a day checking our records, walking through the animals, checking the feed. The check list was long. We initially offered to put him up but that is not allowed in case it’s interpreted as skewing the audit results. He agreed to coffee and banana bread and then because he was half an hour from the nearest eatery he was able to stay for lunch. His mandate is very clear and has strict guidelines and he sticks to them. Charlie said he loves his job; he’s been all over the States and parts of Canada visiting farms and farmers. Quebec has the largest number of AWA producers, not sure now what that is but there are a couple of people in Alberta as well. I think we are number 8 in Canada to be approved by the association. Fortunately for us the local abattoir, Bulkley Valley Custom Slaughter, was also inspected and awarded the AWA designation for abattoirs. Charlie’s background includes both producing and slaughtering animals so he was the ideal person to do this audit. We were lucky that the abattoir passed because if we didn’t have an AWA approved facility to send our animals to for slaughter we would not have been given the designation. They’re very strict. In order to keep the label we have to actively look for AWA approved markets for animals we don’t sell direct. That is going to be a challenge but they know that and will help us to find those markets. With any luck more producers will get on board and take advantage of the opportunity to be confirmed as humane stewards of livestock and legitimate grassers.